As the medical professionals that I work with like to say when transmitting information over the med radio to the hospital about patients they are bringing into the Emergency Department, today I am "conscious, alert, and oriented times four". In other words, I know who I am, where I am at, what time it is, and what's just happened. I'm not exactly sure I can say the same about a good part of yesterday! As I reported in yesterday's blog post, I had an outpatient surgical procedure done at the local hospital that was actually a pretty simple sort of thing that will hopefully reap lots of benefits. It's something I probably should have had done long ago but somehow, just never got around to it. One of the requirements of the hospital was that I have a responsible driver to take me home after the procedure which at the time I thought was kind of funny being that I now live within extremely easy walking distance of the hospital. My friend Rhonda volunteered and ended up not just being a responsible driver but a responsible friend, too! The William W. Backus Hospital is the only hospital here in Norwich and I've been there a time or two recently for assorted things but hadn't actually been there for anything of a surgical sort since 2005 when I had spinal epidural injections for my ongoing back issues. Since then they have changed their entire Same Day Surgery Suite and it's quite nice. Once I got checked in, Rhonda and I were shown to my "room" where I got to meet my nurse, the anesthesiologist, and another nurse who was participating in my surgery. After changing into my new-fangled hospital gown that was really quite cool (none of those gaping in the back, cloth gowns there!) the nurse had the unpleasant task of trying to put my IV in. I say unpleasant because I have absolutely positively horrible veins and it's always a challenge to try to find one to use. Thankfully I know that ahead of time and can warn the nurse that it isn't going to be easy which they always find a bit dismaying because I think the last thing a nurse wants to do is hurt a patient looking for a vein. After tapping on my veins and looking in vain (no pun intended!) for a few moments, my nurse decided to try a double tourniquet to see if that would help. While she did that, Rhonda decided to tell a few jokes in order to relax the situation a bit and finally the nurse found a small vein in my left hand that didn't hide when she went after it. It really didn't hurt but that's probably because I'm used to the process however I'm glad that Amanda doesn't appear to have my veins as when she has to get her IV for her wisdom tooth extraction later this month I would rather she didn't have to go through that. Of course, I could always tell jokes like Rhonda did and see if that helped! Once my IV was in place I was given an anti-nausea medication and then something to help me relax a bit (I think it may have been Xanax but I'm not positive). Shortly afterward my doctor came in and went over the procedure again with me and asked if I had any questions. I had told Rhonda that he was just a kid but that he was really nice and she agreed completely with me as he does look extremely boyish, especially in his surgical scrubs! The only question I had was how long Rhonda would have to wait for me to be out of the operating room and he said probably half an hour to forty-five minutes tops. She'd brought along a good book so wasn't too concerned about it herself but I hated to think she'd have to waste a good part of her day waiting on me. 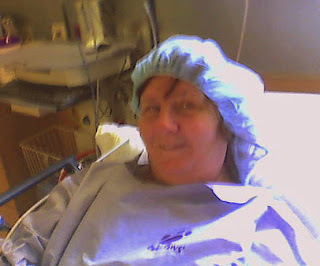 Following that I was wheeled down to the OR while Rhonda cheerily waved goodbye and told me to have a good time! A good time?? En route to the OR I met yet another of the nurses who would be in on my procedure named Dave and then once in the OR I was introduced to Maria but not the other two people who were on the other side of the room. For a simple procedure there sure seemed to be a lot of people in there! Once transferred from the gurney to the operating table I got all strapped in place into what I refer to as the sign of the cross (one arm stretched out on either side) and the anthesiologist put on my oxygen mask and started hooking up her tools of the trade. At that point she asked me, "Republican?" At first I wasn't sure what she meant or how she might have guessed my political affiliation (for the most part though I don't vote party lines) until I remembered the elephant tattoo that I have over my heart. Oh, that! I told her that it wasn't related to politics but that it was a birthday present from my friend Cyndi one year and that it was an elephant because we like to joke in my family that an elephant is the family mascot. Besides, it's purple and not red-white-and-blue! Shortly after that, Dr. Briggs came in and asked me my name and date of birth as well as what I was having done (I guess just to make sure I was still with the program) and then one of the nurses said they were going to attach the pumps that keep you from getting blood clots to your legs and that was it for me ... I don't remember anything else until I woke up sipping cranberry juice in my room. I remember thinking it was odd that they had brought me cranberry juice but I didn't think much of it at the time. I was given some toast to eat and the nurse asked if I was still having any itching to which I said "no" and again didn't think much of that though I thought it was an odd question as I didn't remember saying anything about any itching to begin with though I know for a fact that I have had issues with morphine and itching in the past and thought maybe she was referring to that. At that point I noticed that I was starting to have some cramping so the nurse gave me two Vicodin and said she thought it was strange that I wasn't having any cramping before when she asked but I don't even remember her asking. Huh? Turns out that I was supposedly awake and having full conversations with everyone for a good half an hour or so before I was actually awake though I have no memory of any of that. I had thought it odd that the doctor didn't come by afterward but turns out that he did and even showed me pictures of part of the procedure as well as gave me instructions of what not to do for a few days and what to expect. Huh? The nurses had given me another medication that they said they explained to me (nope), I had requested cranberry juice when asked what kind of juice I wanted (nope), I had asked Rhonda if there were any cute guys in the waiting room (nope) and she had said Dr. Briggs was the cutest one there when he came out to get her to which he apparently told her that flattery would get her everywhere (nope), I said that I wasn't having any cramping at all when asked by the nurses a couple of times (nope), and I did say that I was having some itching when asked and the nurses gave me something for that (nope). When I told the nurse that I didn't remember any of that she seemed pretty surprised as she said I was talking coherently and seemed to know exactly what was going on as soon as they brought me back from the OR. Uh ... no! Rhonda assured me that I didn't say anything inappropriate or embarrassing (0ther than asking about the cute guys in the waiting room I guess) but I have to say that it's really disconcerting to know that I was that out of it. The drug they gave me for the procedure, Versed, is what they refer to as conscious sedation or "twilight sleep" but apparently I was not conscious at all - and I defintely wasn't oriented! I guess maybe that's what people who sleepwalk or sleeptalk go through? Either way it was strange and once I mentioned that I had no recollection of any of the things that went on the nurse made sure to go over my post-surgical instructions with me again and had Rhonda be the responsible one to sign my paperwork. By the time we left the hospital and went to the local CVS to have my prescription filled I was starting to feel pretty sick (I could have used some more anti-nausea medication apparently) and couldn't wait to get home and into bed. In spite of the two Vicodin they had given me at the hospital, my uterus was revolting big-time and I was having some of the most miserable cramps of my life that I was hoping to sleep through, especially considering I felt like I was still tip-toeing through LaLa Land. Jamie got the heating pad for me which helped and I slept almost the entire afternoon away - woke up briefly - and then slept the entire evening away - woke up long enough for the girls to give me some eggs and toast - and then slept the entire night away. I guess that's what they mean by 'rest and recover'! Today I'm feeling pretty good and have no residual pain or anything else to speak of while also seeming to have pretty good control of my mental faculties, especially as opposed to yesterday! That Versed is some powerful stuff! Should be interesting to see how Amanda reacts on the 23rd as that's what she's going to be getting at the oral surgeon's office for her procedure - maybe I'll have to take some videos! I almost wish someone had been taping yesterday as I have absolutely no idea what I said or did but now I know why one needs a responsible driver, as well as a responsible friend, to be there! Thanks again, Rhonda! Poor Duchess. You got some strong stuff given to you yesterday. Today will be better, you're conscious, alert, able to touch your toes...I hope. Glad you have no residual pain. Consider yourself very fortunate to have a friend like Rhonda to be there with you. That's wonderful. Patti - I'm not sure that I am ever able to touch my toes unless I'm sitting down but thanks for the thought anyway! And I consider myself very fortunate to have a friend like Rhonda always! dearie, versed is not the only drug you were given. It's not the "conscious sedation" drug but rather part of a coctail. versed is an amnesiac. everything from the time you take it till it's out of your system will be forgotten. That's how the drug works. I guess I've been lucky in that I've had few surgical procedures and no issues with anesthesia. Glad you're feeling so much better today, and I sure hope that's the trend from here on out! I've lost my memory a couple times...once with morphine/percadon...and once with tequila. glad the girls are taking care of you even if they aren't mowing the lawn. keep resting..let yourself heal...even if you think you feel better...your insides still need to sit still and heal. If Amanda reacts anything at all like my brother did after getting his wisdom teeth removed, you'll definitely want to have a video camera handy. Like someone else said, Versed does pretty much kill off short-term memory. In my case, the first couple of times I had it I didn't remember a thing. But the last three times I had it, I remembered pretty much everything that happened. Except for oral surgery I had last year. I don't remember anything during the procedure, unlike my last two colonoscopy procedures. I guess it depends how much they give you. You can probably do without those particular short term memories anyway. So glad you have a friend like Rhonda. Hope you spent today on the couch, relaxing. sorry I missed your message back yesterday. Hope you are feeling even better today. I keep saying it's good for the flowers and vegetables! Glad you're feeling better. I can so relate to the medication thing. I had a procedure done not long ago and asked pretty much the same questions. Talk about out of it. I trust that by now you're feeling tip top. While i am sure we didn't have the same procedure exactly, the set up seems very similar. I remember the uncomfortable skinny table, tied hands and all. Creepy. And I rememebr not feeling the cramps until later on.